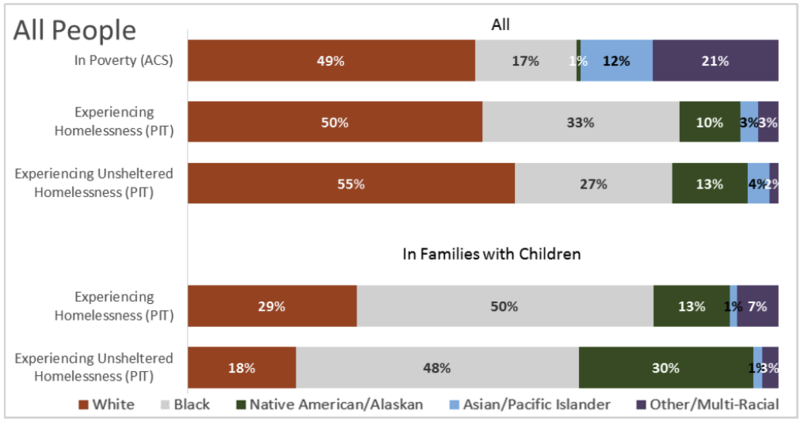 HUD is pleased to announce the availability of the Continuum of Care (CoC) Racial Equity Analysis Tool to help communities understand who is accessing their homeless service system and what outcomes those families and individuals are realizing. Over the past year the United States Interagency Council on Homelessness (USICH) has been highlighting promising practices from the field on how to better understand and address the overrepresentation of people of color among those experiencing homelessness. In November 2017 USICH discussed using GIS mapping to help address disparities in homelessness assistance. The USICH post discussed the use of GIS to analyze local demographic patterns in homelessness and system performance trends. The CoC Racial Equity Analysis Tool can help identify racial disparities in your system. The racial distributions of people living in poverty by race and ethnicity, age, and veteran status are sourced from the American Community Survey (ACS) 2011-2015 5-year estimates. The CoC level estimates were determined from Block Group (BG) estimates along with a BG-to-CoC crosswalk. The number of people in a state and the Your Point in Time 2017 data from the AHAR lists the numbers of people experiencing homelessness by the same demographic categories. Each CoC’s information has been pre-populated into the Racial Equity Analysis Tool. You can find the CoC Racial Equity Analysis Tool, Instructions, and Methodology on the HUD Exchange.